A stunning chimneypiece previously in New Gala House, Galashiels, is set to be amongst the top lots in our forthcoming Fine Furniture & Works of Art auction scheduled for January 27 2016 at 10am in our Edinburgh saleroom. Sir Henry Cheere (British 1703-1781), is renowned as one of the very first British sculptors and masons to rival the skill demonstrated by his European rivals and predecessors. Cheere's career began in London in 1718, as an apprentice. By the time he was twenty-three he had established both a reputation for quality and his own firm of sculptors, which led to him being named, aged forty, as 'carver' to Westminster Abbey, where he is known to have created at least nine monuments. In 1760 he was knighted and in 1766 made a baronet of St. Margaret's, Westminster. Sir Henry's designs feature in country houses, mansions and institutions throughout the UK, and his habit of not signing his work, combined with the large number of sculptors and apprentices he employed has sometimes made clear attribution of his less monumental works difficult. With its characteristic use of white statuary marble onto a Jasper marble ground, this chimneypiece carries clear signs of Sir Henry Cheere's design, and was possibly supplied by the sculptor Francis Harwood (fl.1748-1783) at the end of the 18th century. 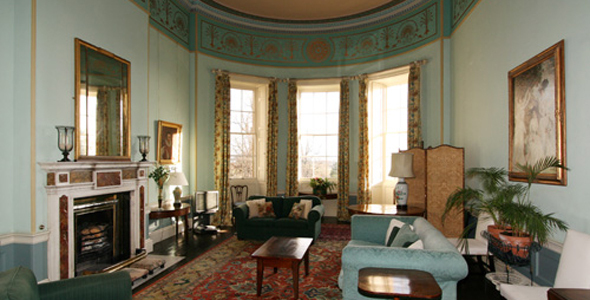 An almost identical chimneypiece exists in the first-floor small Drawing Room at Wedderburn Castle, Berwickshire and its attribution to Harwood is suggested by its construction, with the stretcher and shelf mouldings formed as a single piece of marble, typical of the Italian style of this period. It is known that Harwood worked as a 'stone-cutter' in Florence, and was a prolific maker of chimneypieces. He also became one of the major providers of sculpture for English aristocrats visiting Florence on the Grand Tour. Please click here to see the full catalogue description of the chimneypiece.